Tommy Roling does everything humanly possible to raise his infant daughter Corinne the right way. But a half year out of high school, Tommy finds himself a single parent as well as flat broke. And, with every full moon, he can't fight the urge to strip off his clothes and run wild through the pastures outside town. So when a stranger shows up, slashed to death, the day after Tommy's most recent full-moon run, Tommy must resolve this murder or he could lose what little he has left. That includes his innocent baby girl Corinne, who just might have inherited his werewolf gene from him. Michael Jasper is fascinated with exploring the places where the normal meets the strange. In pursuit of this fascination, he has published over a dozen novels, a story collection, and six dozen short stories, along with a digital comic with artist Niki Smith. He's also put together two how-to books about how to create digital comics (also with Niki Smith) and how to create and market digital books. In the past he's tried bartending, teaching junior high, painting houses, being a secret shopper, working construction, and many more jobs; he prefers fiction writing. For his day job, he works as a technical writer. 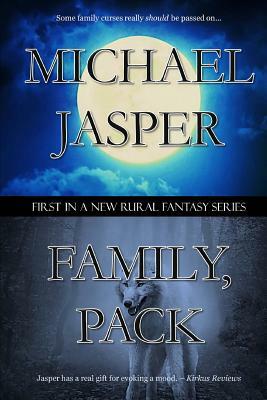 He lives with his family in North Carolina, and his website is michaeljasper.net.